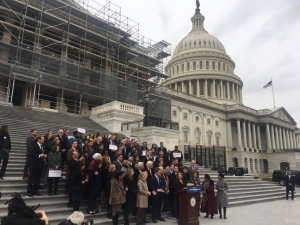 WASHINGTON — U.S. House Democrats today passed a broad election reform and ethics bill that they’ve made their top legislative priority this Congress. The legislation, referred to as H.R. 1, passed the House on a vote of 234-193 on Friday along party lines. Its passage marks a symbolic win for Democrats, who seized control of the chamber this year after eight years in the minority. But the measure is unlikely to get a vote in the GOP-controlled Senate or make it to President Donald Trump’s desk. “For months, for years, really for decades, millions of Americans across the country have been looking at Washington and feeling like they’ve been left out and left behind,” Rep. John Sarbanes (D-Md. ), the lead sponsor of the bill, said Friday outside the U.S. Capitol. “One senator said this is a power grab. Yes it is, it’s a power grab for the American people,” California Democratic Rep. Zoe Lofgren said Friday. Robin Bravender is the Washington Bureau Chief for The Newsroom network, of which NC Policy Watch is a member.